In 1936 Popular Publications ceased publication of their Yellow Peril pulp The Mysterious Wu Fang. It was immediately replaced by a new Yellow Peril pulp, Dr Yen Sin. 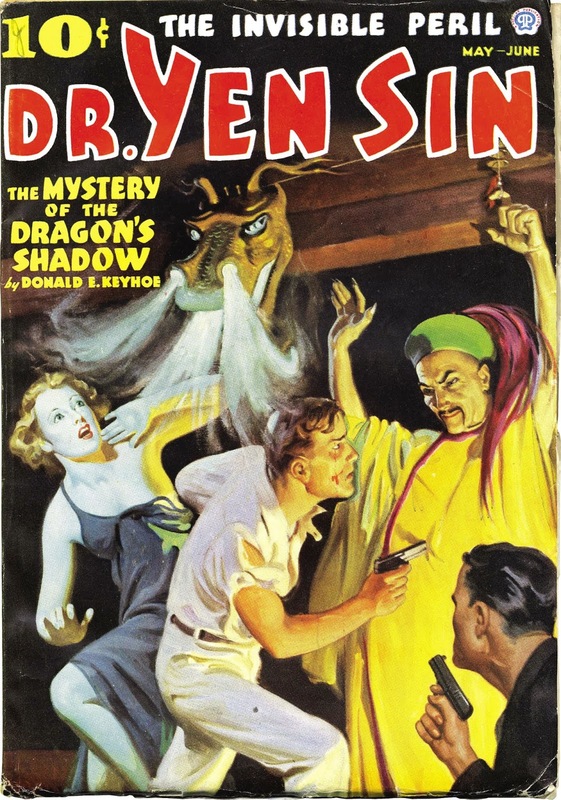 Each issue contained a Dr Yen Sin novel. Three issues appeared between May and October 1936. 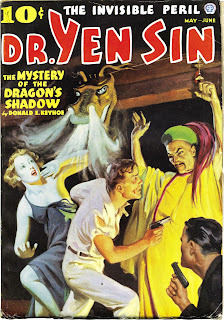 The first of the Dr Yen Sin novels was The Mystery of the Dragon’s Shadow. All three novels were written by Donald E. Keyhoe (1897-1988), in my opinion one of the best pulp writers of the era. Keyhoe later became famous as a UFO researcher. The Mystery of the Dragon’s Shadow is set in Washington but this is not a Washington that would be familiar to most people. It’s like Washington reimagined by Conan Doyle, Edgar Wallace and Sax Rohmer. Everything is shrouded in fog. All the time. There is danger lurking around every corner. Menace seems to be in the very air. Dr Yen Sin is, not surprisingly, rather similar to Dr Fu Manchu. He’s a diabolical criminal mastermind with dreams of global power. He’s not as morally and psychologically complex as Fu Manchu (Keyhoe was writing for a pulp audience that wasn’t likely to have much patience with complex villains). He lacks Fu Manchu’s highly developed sense of honour. He also lacks Fu Manchu’s visionary qualities. Dr Yen Sin is a sadist. Fu Manchu cold be ruthless and even brutal when he considered it necessary but he could never be considered a sadist. Compared to Fu Manchu Dr Yen Sin is really a stock melodrama villain. Like Dr Fu Manchu Dr Yen Sin is a bit of a scientific genius, with a knack for inventing fiendish and deadly devices. Dr Yen Sin’s nemesis is Michael Traile, a young man with some peculiar characteristics. As a result of a botched brain operation he never sleeps. An odd side-effect of this was to accelerate his intellectual development and given all the extra time he has due to not sleeping he has become an expert in many different subjects. He’s in many ways a typical Keyhoe hero. Like Philip Strange (possibly Keyhoe’s best-known creation) he’s not a superman or a superhero but he is a hero with a special ability that gives him a chance of surviving encounters with the most dangerous of enemies. And Traile’s special ability does come at a price - he is subject to sudden attacks of exhaustion. He has paid an even higher psychological price, being forever a kind of outsider. So he actually has some complexity and he’s an ambitious creation for a pulp writer. Traile of course has a sidekick, Eric Gordon. Eric is brave and dogged and occasionally useful although inclined to get himself into trouble. There are a couple of women characters who fall into the ever-popular beautiful but dangerous category. In this case Keyhoe manages to keep us wondering right until the end whether Sonya and Iris will turn out to be evil or not. It has all your favourite pulp thriller clichés - there are secret passageways, hidden trap-doors, disguises and a plethora of narrow escapes. Plus a variety of infernal machines. This is the sort of thing that Keyhoe does well, and he manages to make it all seem reasonably fresh and exciting. The setting is so much in the Edgar Wallace/gothic/foggy London mode (it even has opium dens) that you might at first wonder why Keyhoe chose Washington. Actually it does make sense since important scenes take place in the Japanese Embassy and Dr Yen Sin’s attempts to interfere in international relations are a vital plot point. Altus Press have republished all three Dr Yen Sin adventures. The Mystery of the Dragon’s Shadow is fine pulp fun. Recommended. Other Donald Keyhoe pulp titles that I highly recommend are Strange War, The Complete Adventures of Richard Knight and Vanished Legion.